Last Friday you could have gotten a free doughnut at Walmart, Krispy Kreme, and Dunkin’ Donuts. The reason? Since 1938, the first Friday in June has been National Doughnut Day. But there is more to find out about the doughnut. We could call the 1920s the era of the consumer. For the first time, people could buy affordable nylon stockings, canned pineapple, and radios. They could also get a mass produced doughnut because of a Bulgarian immigrant. Adolph Levitt’s story starts with the small batches of doughnuts he was making in his Manhattan bakery shop window on 125th Street. Although the doughnuts were popular, people complained about the fumes. So, with help from an engineer, he devised what he called the Wonderful Almost Human Automatic Doughnut Machine. Pictured below, it formed, plopped, and fried rings of dough that could become 1,000 identical doughnuts in one hour. Some describe Levitt’s machine as the first while others say there were many when his was created. Whichever story is accurate, our key is that Levitt helped to speed doughnut mass production. Selling the machines and donut mix, he soon had a multi-million dollar business. To end with doughnuts, we need to start with Adam Smith. In his Wealth of Nations (1776), Adam Smith described the benefits of mass production. Focusing on one pin factory, he showed how a division of labor saved time, elevated production, and diminished each item’s cost. Smith told us that one worker, alone, might not even produce a single pin. But when 10 workers divide 18 different tasks and each one specializes, output soars to a whopping 48,000 pins a day. Then, once you have all of those pins, trade and regional specialization develop. But we will save that story for another day. For now, we can return to doughnuts. 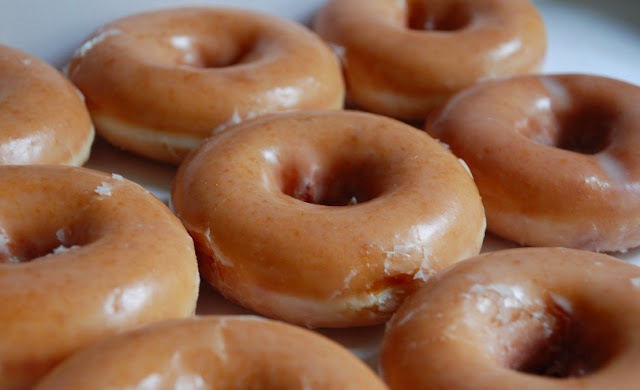 Krispy Kreme tells us that one of their larger stores can produce 12,000 doughnuts an hour–quite enough for National Doughnut Day. My sources and more: Happily, there exists more doughnut research than I ever imagined, but sadly, it was not academically rigorous. Still, if you want some interesting doughnut reading, the best is on the shrinking size of the doughnut hole from Vox. From there, you could continue with this Smithsonian history, this Marketplace podcast, and Adolph Levitt’s granddaughter’s NY Times article. Meanwhile, here is more about one of the first doughnut machines. Please note that today’s featured image is from urbanmatter.com.